"Mighty oaks from little acorns grow." It has taken 45 years, but that aphorism has proved itself true regarding natural foods. There certainly was nothing very natural about Ann Arbor food back in the early 1960s. And I am so tired of ne'er-do-wells telling me that "The Sixties" was a mistake and has brought the country nothing of real value. Are they serious? I keep waiting for someone to set the record straight, but as Dylan says "It's not dark yet, but it's getting there." So, as we can find the time, let's those of us who were there count the blessings of The Sixties, one-by-one, while we can. I am going to start off with food and my connection with Eden Foods. What would Ann Arbor (or for that matter, the whole country) be like without Eden Foods and endeavors like it? Eden Foods is just one of the great concepts that became companies in the 1960s. Let me set the stage here for a moment. Diet, like family backgrounds, is very hard to change. In the early 1960s, when I was still (at least in my mind) a beatnik, I was not into natural foods or whole foods, much less organics. I would eat about anything. My mom brought her five sons up on a regular American diet, whatever we can agree that was. It was only in the later 1960s, after the onset of what we now call "The Sixties" that my interest in WHAT I ate stirred, and I can't remember just how that went down. I do remember reading (and re-reading) "The Mucusless Diet Healing System" by Arnold Ehret, with his emphasis on fasting and the value of alkaline over acidic foods. Certainly I went on all kinds of raw-foods diets back then, mostly my idea of salads, and probably more so in the summertime. Even today I still believe the best first step when I reach a food crisis (and it seems I reach these all the time) is to fast for a day (or part of a day) and see what's going on with me. And it's not like Ann Arbor was already "green" or obviously into healthy foods back then. Ann Arbor had restaurants and they were mostly run by Greeks, but they didn't serve actual Greek food, but just the same old mashed potatoes, meatloaf, and olive-drab peas kind of thing. And Ann Arbor also had a handful of good German restaurants, but there is nothing healthy about that food either. I can’t remember when I first fell in with the Eden's crowd. They weren't even a crowd yet back then, but just people coming together. I knew Eden Food's original founders Bill and Judy Bolduc early-on, just as folks about town. I believe they were astrological clients of mine. As for Tim and Pattie Redmond, who also helped found the company, they were friends. In fact, I married Tim and Pattie, something I used to do now and again back in the day, and they are still together! I'll bet I knew most of the food-folks in Ann Arbor at the time. There were not that many. It probably got more real when Eden Foods asked me to pick the exact date and time for their company's incorporation. As mentioned, I was an astrologer-about-town back then. And the date I picked turned out to be November 4, 1969. I guess it was propitious, because the Eden Foods is still going strong. 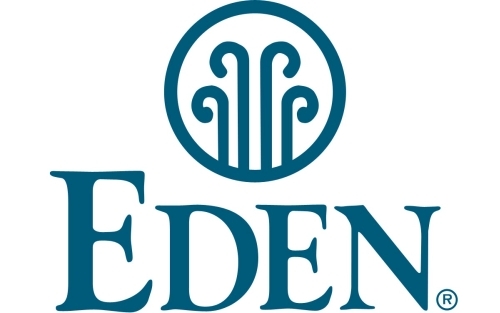 I am told that Eden Foods is the only large natural-food company that is not today owned by conglomerates, and this probably thanks to the tenacity and vision of Michael Potter, their current CEO. Originally called Eden Organic Foods, it was first incorporated as a non-profit corporation by entrepreneur Bill Bulduc, and was kind of a loose natural-foods co-op with a retail store at 514 East William St. in Ann Arbor, which was little more than a small upstairs apartment as I recall. I also was asked to design a poster for Eden Foods, which promptly became the logo which they still use today, you know, those four little sprouts in a circle. I include it here. For the record, the inspiration for that logo came from my love of the incredible simplicity and beauty of Japanese art, and in particular Japanese funereal crests. I was struck by the utter understatement and clarity of Japanese family funeral symbols. Anyway, that's where Eden's logo came from. And while I don't want to lean on the horn, I owe you younger folks at least a tiny reminder of how hard-fought the fight has been to bring healthy food to the table in this country, almost forty-five years later! Back in the 1960s, there were no natural-food restaurants, Whole-Foods stores, or anything like that. Sure, we had health-related stores, sometimes even called "health-food" stores, like the one down on N. Ashley in Ann Arbor, but there was no real food there, just rows and rows of vitamins and supplements, mostly for older folks. I could never find anything there I wanted to have. To me they always seemed like a throwback from the 1950s or earlier. In late 1971, Julian Moody opened Applerose at 404 W. Liberty and it actually had some natural foods, but it lasted only about a decade. One friend of ours was Ken King, who founded Frog Holler Organic Farm back in the early 1970s and began producing organic, pesticide-free, food for the Ann Arbor area. They are still going today. And King was also co-owner of Indian Summer Natural Foods Restaurant in Ann Arbor, where we would go mornings to have their incredible natural-grain pancakes. And it was there that my friend Dana Wilkinson made yeast-free loaves of bread each day. In the early 1970s, for a while, there was also the Rainbow People's weekly neighborhood grocery program, where for a few bucks you could get two grocery bags full of produce hauled in from Detroit's Eastern Market. Margaret and I subscribed to that and it was a good thing. I believe my friend John Sinclair helped to get that going. My point here is not to put down what was there back then, but rather to point out that just as babies take time to grow up, new ideas and approaches take just as long, sometimes until the die-hards die off, but perhaps nothing takes as long as changing our eating habits, unless it's losing weight. So, way back then Eden Foods was just a tiny store with a new idea run by people we knew, our friends. I can very much remember macrobiotic dinners and cooking classes, where we would go to someone's home, learn to cook a macrobiotic dish, and then all sit down and have dinner together. For me, it all kind of started there. And I will spare you what little I know about the many changes Edens has gone through, changes of ownership, location, etc., like their move down into the basement of 211 S. State Street, where my old alma-mater bookstore Bob Marshall's Books used to be, and so on. At some point Michael Potter, currently the CEO of Eden Foods, came into the picture. Potter is a piece of work, and that's a compliment. To use macrobiotic terminology, Michael Potter as a person is very "yang," something macrobiotic folks seem to prefer. He is tough, bright, and not about to be pushed around by the exigencies of life. Michael has been a leading force at Edens for many years. I am proud to call him a friend. Somewhere around the fall of 1974 Potter made his first trip to mainland China, one of at least a dozen trips he has made, something that American businessmen just didn't do back then. That was a brave move, to actually go over to Communist China and connect with the Chinese, eyeball-to-eyeball, and he did the same with the Japanese. Potter has always had real vision and stick-to-it-ness. By the early 1970s there was a core group of us that were all about macrobiotics. Keep in mind that there was no tofu back then. Sure, you might find some overly-processed soy curd at an oriental grocery, but who knows what was is in it or how it was made. We learned to make tofu ourselves, at home, and it is quite a process, boiling the soy beans, mashing and straining them, pressing them into curd, and all of that. And we pounded sweet rice into Mochi too. We also made our own pickles by fermenting daikon and all kinds of vegetables. There was no tamari in the stores, so we had to import it in little wooden kegs and casks and store it in the basement. Once again, Edens got it for us. In fact, our damp Michigan basement at 1041 N. Main Street in Ann Arbor was full of all kinds and sizes of wooden tubs from Japan. There was Mugi and Hatcho miso, and other kinds too, plus tiny kegs of omeboshi plums, twig tea, and so on. We were our own bulk-food store. My wife reminds me that I also had a little touch of the survivalist back then, and tended to hoard food. And we made our own Tekka, a condiment. Raise your hand if you know what Tekka is? We would go out in the yard and dig up Gobo (Burdock root), and so on. We still make Gomasio, roasted sesame seeds with seaweed, about once a month. And we would import seaweed from the east coast and then dry it in the side yard like clothes on the line. See the photo. The takeaway here is that the above foods were not all that we ate. Maybe at first, when we were purists, but today we eat almost everything, but with an attempt at least to balance the foods we eat, so they work together to keep us healthy. That's macrobiotics in a nutshell: balance. Of course, personally, I have found myself dropping certain foods from my diet in order to stay alive, so to speak. I gradually realized that certain foods make me sick, like sugar. I don't eat sugar in anything but natural fruits at this point, and dropping sugar was one the best choices I ever made. I immediately felt stronger and better, because every time I ate a bunch of sugar, my body would go into a kind of swoon until I recovered some hours later. I don't mean I would pass out, but I could feel my body struggling with the sugar-high, and that didn't seem worth it. Easy solution: stop eating the stuff. I honestly believe refined sugar is a poison. And caffeine too. If I drink coffee or eat chocolate, I don't sleep, etc. And in my house we don't eat processed foods anymore. We make everything we can from scratch. I could go on, but you get the idea. What we do eat are whole foods that we like and that are nourishing too. I probably eat too much popcorn these days, but it is relatively harmless. "Relatively" is the operative word. As mentioned, Eden is something that The Sixties brought us, and it blessed Ann Arbor first of all, and then the rest of the country. However, the one thing I most remember is the little Eden Foods store and eatery at, I believe, 330 Maynard Street, up near Nichol's Arcade, tucked away in a little cul-de-sac that almost looked like an alley. I believe maybe Tim Redmond ran the place. It was there that they made the one food I have never been able to forget, Eden's fresh-made chapatis. I would go in there around Noon and they would hand me a large warm chapatti that was lightly scorched on the outside from an open flame, but still soft within. And inside would be various steamed veggies (onions, carrots, cabbage, broccoli, perhaps parsnips) bathed in a sesame-tahini sauce, with a touch of salt. This much of the recipe I know from an old friend, Steve Sailor, who actually got up at 5 AM in those days and began to chop veggies in 5-gallon buckets to prepare for lunchtime at Edens. I can't think of any meal in my life as wonderful as those Eden chapatis. I wish they were available or that I could make them. I have tried, but it was not the same. As they say, we are lucky if we can step in a river even once! And before I end this, I should say something about macrobiotics. I owe you that. In the late 1960s I was all about Macrobiotic food balancing, and still am today for that matter. Unfortunately, the macrobiotic diet has gotten a bad rap over the years, something to the effect that if you are macrobiotic you only eat brown rice until you die from malnutrition, and yada-yada-yada. What a bunch of baloney that is. Macrobiotic foods and diet is not about any particular food. It is all about balancing foods to stay healthy. Brown rice often comes into the picture when we are unwell, as a way to stabilize and stop force-feeding ourselves with junk, at least until we can see where and just how we are out-of-balance. When I overeat and get carried away with food or life, I find the best thing is to just stop eating for a couple of days and let the smoke clear. After fasting (at least for me), brown rice (especially short-grain brown rice) is a good food to begin putting back into my system. For me, Lundberg short-grain brown rice is like the air I breathe or the pure water I drink, a common staple (and stable) food, almost like a wrapper, to which other foods are added. Brown rice is a basic life-food for me, something I always go back to, especially when my health gets sketchy. Anyway, a macrobiotic diet refers to how we balance foods, and not what foods we eat. The actual foods depend on our locale and the climate, like when it is cold outside I eat more roasted root veggies, oatmeal, etc., and when it is hot outside I eat more yin foods like fruit, and so on. That is the balance I am referring to here. That is macrobiotics; it's not just about eating brown rice, although fresh-cooked short-grain brown rice, if you know how to cook it, is mighty special. In fact, I am eating some right now as I write this and the high temperature today looks to be a balmy 12-degrees out. On a plate in front of me is fresh-cooked Lundberg short-grain brown rice, steamed broccoli and cauliflower, with small pieces of marinated (and lightly fried) tempeh with a dribble of South River organic tamari over all. I can already feel it counteracting the out-of-whack-ness I have been feeling lately. Is food medicine? Actually it is and we can learn to be our own doctor, at least preventively.